1. Whole cereals and pulses like whole wheat, oats, brown rice, barley, bajra, bran, moong, matki, etc. 2. All fruits and vegetables especially sweetlime, apple, grapefruit, green peas, cluster beans and all leafy vegetables. Make sure you also drink enough water and other fluids along with including these fibre dense recipes to help avoid constipation. You can also make your in between snacks fibre rich by trying preparations like Oats Mutter Dosa an innovative instant dosa recipe and is packed with protein and fibre. Oats must be consumed daily for its high content of soluble fibre ‘beta-glucan’, a potent blood sugar and cholesterol-lowering agent. The addition of urad dal and carrots make the dosas rich in protein and vitamin a too. Doodhi Thepla is a healthy snack that is full of protein, calcium and fibre and can be made 'healthy' by skipping the oil that is considered so essential to cook them. When craving for something sweet during snack time then try this Stuffed Carrot Halwa Pancake that is healthier and will also leave you satisfied. Loaded with essential nutrients and satiating too, these halwa packed and cinnamon laced whole wheat flour pancakes are ideal for pregnant women. Lettuce, Orange and Spinach Salad is a colorful one that’s sure to appeal to your taste buds as well your eyes. This fibre rich salad will also add plenty of vitamin A, vitamin C, calcium and iron. Since vitamin C is a very volatile nutrient, it should be added just before serving, so do use freshly squeezed lemon juice. Black Bean and Bulgar Wheat Salad is an energy dense salad and gives good amount of protein and fibre to your diet to keep you fit and fine. Cabbage and Moong Dal Salad is rich in protein, fibre, folic acid and iron, this simple salad is good for a mid-morning or a late afternoon snack too. Add fruits to your salads and make it more nutritious just like our recipe for Fruit and Lettuce Salad where fresh fruits are tossed with salad greens and then dressed in a syrupy sweet and spicy dressing that is inspired by a thai salad. This salad is a visual delight that is rich in iron, fibre, vitamin c and fructose. For main meals of the day, try recipes like Barley Khichdi, Chawli French Beans and Carrot Soup, Jowar Bajre ki Roti and so on. 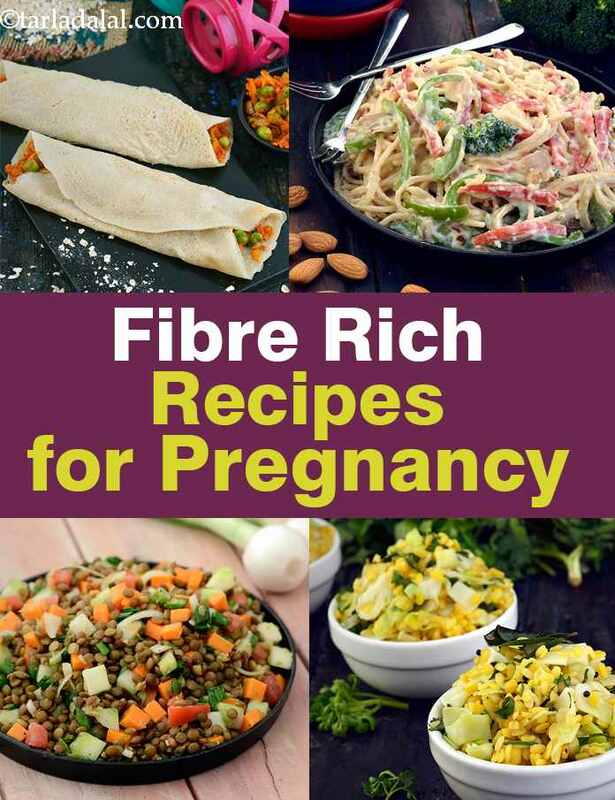 Enjoy all our fibre rich recipes to eat during pregnancy. Explore more varieties in our pregnancy section everyday.